Great questions. 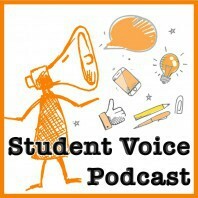 Genuine student voice is one of the most potent learning tools for both staff and students that we have available to us. Thanks for the article – enjoyed it. Thank you, Jan! Absolutely – students led research definitely an upcoming post. Would welcome a post from you at any time. Glad to see you following! One of my favourite books is Melvin Delgado’s “Designs and Mehods for Youh-Led Research” is a great resource for anyone interested in the topic. It covers topics such as competencies students need, research methodologies, limitations and making room for innovation. When we all learn together — innovation really can happen. Thanks Jan, I will add it to the recommended reading list. Hope all is well. I was there on that day too 🙂 Loving this site!!! We just did 3 student sessions and I learned a ton! Thanks Sue! Glad you are reading–if you ever want to post or if you know someone who would they would be welcome!